Phawuzz! They must call it Encore because we've seen it before, only not so red! 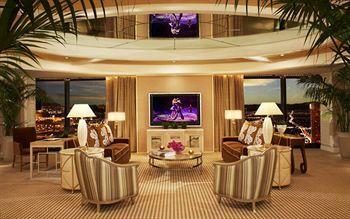 Everything is a suite at the Encore Hotel at Wynn Las Vegas. 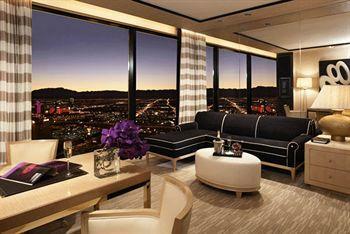 It better be for these prices, which propose to be the highest on the Strip. The rooms are at least 700 square feet, or what we like to call "our downstairs". There is a sleeping area and a living room, some with a partition and a huge, swiveling flat TV. The living room has a sofa, desk with chairs, with an office-style phone. The windows are floor to ceiling, and you can pay extra to stay in a room with a really nice view. Colors are generally neutral, mostly light browns with very dark upholstery. The bathroom has another flat-screen TV in it. The bathrooms also have lighted vanities, two sinks and separate tubs and showers. We love that because once we soak in a bath it's too dang filthy to ever use again. There are phones in the bathroom, too, so if you're in the tub, you can get on the horn and call your friend in the shower on his cell. It's a great way to plan your night out at XS Nightclub, and makes a perfect conversation starter later! 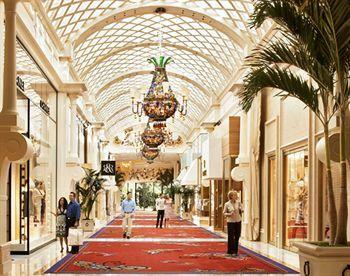 Of course, the Encore Hotel at Wynn Las Vegas employees are unfailingly nice, even to the likes of us. 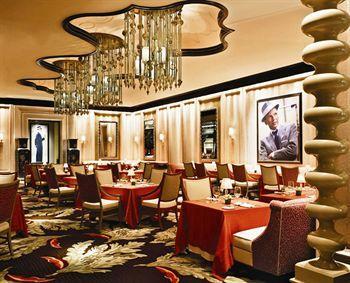 More of Steve Wynn's own fancy, pretty-smelling concoctions. There is shampoo, lotion, conditioner and other pretty stuff to keep your inner ears, nose and face clean. Encore Hotel and Casino Las Vegas seems to be targeting an older clientele who likes to pay a lot for their drinks, but not necessarily in a noisy nightclub. Expect people in their 40s on up and a lot of German and Italian cars in the valet. We do not mean Trabants and Fiats. It's beautiful! Encore Las Vegas Hotel wouldn't give you anything less though. 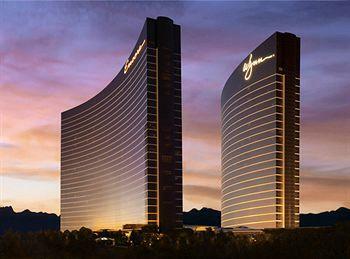 Encore Hotel at Wynn Las Vegas is pricey. You'll get a quiet and luxurious room and it will be nowhere near cheap. 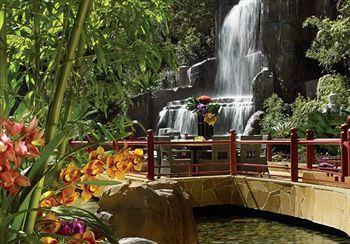 You can actually stay your whole trip in a different hotel for the price of one night here. 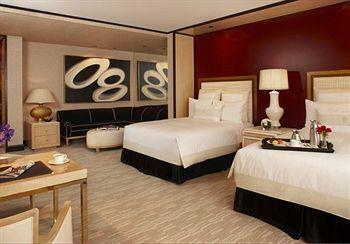 The Encore Las Vegas Hotel and Casino is fancy, for sure. 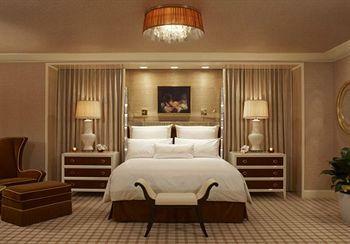 Marble, red, a butterfly theme and more red along with the red drapes that Wynn seems to love. The gaming areas are red and in small alcoves and rooms, which break up the space. Table games, often red, include blackjack, craps, roulette (single zero at high mins), baccarat, Let it Ride and sucker games like a Big 6 Wheel and Casino War. No matter how swanky you make a casino, you can't get around the inherent tackiness of slot machines and video poker. They want $10 minimum and look for $25 or more on busy weekends. Craps has standard 3x4x5x odds. The Very High Limit salon often has tables with $1000 minimums and a security running around trying to keep us out. They have the penny machines that are so beloved, but they really feel so out of place in all this opulence. The slots then go up to $5000 in the high-roller areas. But Encore doesn't have a lot of slots, and there is elbow room when you play them. Good cocktails served pretty promptly, even to the low-roller. The cocktail waitresses are quite nice to look at, and want you to tip heavily and ask them to marry you. The Red Card tracks your slot play and your table action. If you're a low-roller, don't expect much. The casino will send discounts to moderate players, though. Cover: Fri. Sun. and Mon. $20 for men and $30 for women, Sat. $20 for women and $50 for men. 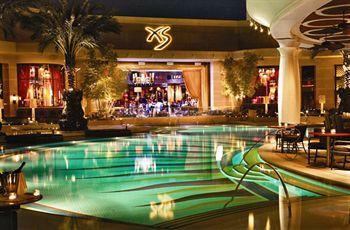 XS Las Vegas is the biggest, most glamorous and most popular club on the Strip. The combined genius of Steve Wynn of the Wynn and Encore fame and Victor Drai of Drai's After Hours party has created a monster with long lines and a packed dance floor. But the huge open space of the outdoor pool area makes it so that despite the huge crowds you can still have good time. Cover: $20 for ladies. $40 for men. Surrender Nightclub Las Vegas is one of the hottest clubs in all of Sin City. 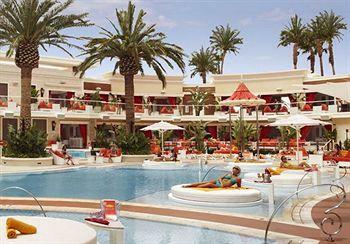 It's not easy to stand out in a sea of Vegas mega-clubs but with a 4,500-square-foot outdoor area, famous DJs, and a gorgeous pool, Surrender Las Vegas has done the impossible. 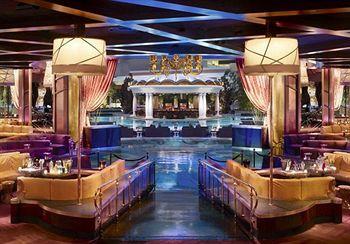 This upscale club combines intimacy with an out of control party scene on the Vegas Strip. Zero. That works out to an infinite number of TVs per seat, which is a great ration for zero people to enjoy. One windows with two screens showing odds behind them. No. This is just a kiosk next to the slot club and in the middle of a bunch of slots. Nothing nearby and no "snack" places in the building. This place is just an outpost of the Wynn sports book next door. You're supposed to bet here if you're on the go. 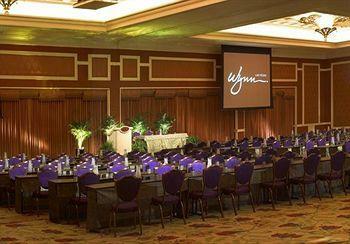 If you have the time to sit down and watch a sporting event, head over to Wynn Las Vegas. 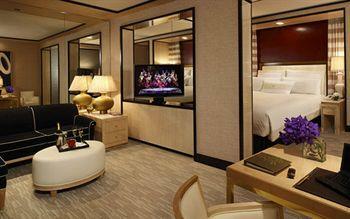 All of the suites at Encore Hotel at Wynn Las Vegas pretty much offer the same features. You get only the fanciest and most comfortable king bed. There is a separate sitting area for sitting and such, and a flat screen TV with cable/satellite channels and pay movies. Internet access is included in your resort fee. If you're staying at Encore at the Wynn you probably also brought some fancy things, and you can store them in your safe, or in the minibar. Our most valuable things usually go in the minibar at least. In the bathroom you get all the fancy soaps as well as a TV and phone and separate bathtub and shower. 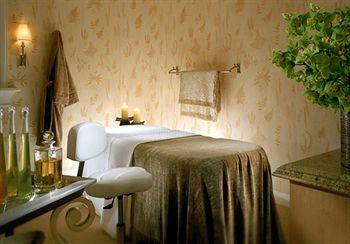 The suites are all similar, but there are suite options in the tower, parlor, salon or a resort suite to choose from.